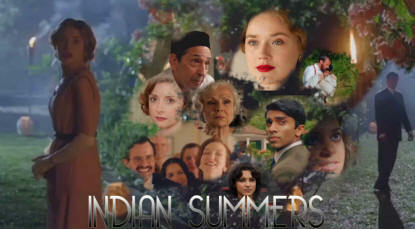 Comments on the Historical Accuracy of "Indian Summers"
Though the Indian Summers series are dramas, assertions have been made in interviews with the writer and members of the cast that the events portrayed are based on historical facts. Clearly, a great deal of care had been taken over sets, costumes and locations. The story lines are interesting and the programmes are beautifully filmed. However, the historical context shown is grossly inaccurate and designed to show the British governing classes in the worst possible light. The two themes than run through both series are that a few thousand British officials ruled the subcontinent and that the British were clinging to power. Indeed, the former assertion was the first thing the viewer actually saw in the first series. Both assertions may have been accurate in the 1890s but not in 1932. The programme makers are obviously unaware that in 1917 Sir Edwin Montagu made the momentous declaration that responsible Indian government was the goal of British policy. In 1919, under the Montagu-Chelmsford reforms, the first significant transfer of power to the Indians took place. Provincial Assemblies were established with elected Indian Ministers in charge of areas such as health, education and agriculture. At the time of the first series, some of the British civil servants in Simla in 1932 would have been serving Indian ministers. The 1920s also saw Indianisation of the Indian Civil Service. Indians began to be appointed to the highest ranks of the ICS. For example, V P Menon was appointed Deputy Reforms Commissioner in 1936. He was the second most senior constitutional advisor to the Viceroy. The Viceroy and his private secretary would have been discussing administrative matters with senior Indian civil servants and not with a junior clerk who had been promoted to senior clerk like Mr Dalal. At no stage during Indian Summers first series did the audience see Indian Ministers or was there a mention of them. The erroneous impression was given that the British were entirely in charge. Though the Round Table Conferences in London were mentioned in the series, the extent of power transfer agreed by the colonial authorities was not. In 1929, the Viceroy, Lord Irwin, agreed with Gandhi that India would become an independent dominion like Canada and Australia. At the London conferences both sides agreed that the entire internal governance of India would be transferred to the Provincial Indian Assemblies and Ministers with the Viceroy retaining foreign affairs, defence and ultimate responsibility for law and order. What affected the daily lives of ordinary Indians would be decided by Indians themselves. There were disagreements about how the elections were to be conducted. The British favoured separate electorates so that minorities such as Muslims, untouchables and women were properly represented but the Indians favoured and system based on proportional representation. It is absurd to describe this process as ‘divide and rule’ given that a considerable extent of power was being transferred to the Indians. In the first series, the disagreements about the electorates were mentioned but there was no mention whatsoever of the extent of transfer of power. A false impression was created in the series that the British were clinging to power. After Gandhi gave up his absurd fast to stop the untouchables getting allocated seats in the assemblies, the British announced the weightings of the parties in 1933 which the Indians accepted. The Bill to transfer power was introduced in parliament in 1934 and the Government of India Act was passed in 1935. Elections were held in 1936. Congress contested the elections and formed governments in most of the provinces. But they did not take office until they received the assurance form the Viceroy that the British-appointed Governors would not use their reserve powers in a capricious manner. The new Assemblies started functioning in 1937. During this period there were considerable advances in the fields of rural development, education and encouragement of cottage industries. Hence there was a considerable extent of power transfer in the 1930s and after Gandhi called of his campaign of civil disobedience in 1934 till the outbreak of WW2, there was relative harmony between the British and Congress. There was little progress, however, in the federal part of the Act in which the princely states were meant to join a federal India. This is understandable as in the early years the British concentrated on getting the Provincial Councils operating successfully. The Government of India Act (1935) was a major milestone in the path to independence. Within the Act there were provisions to enable India to become an independent dominion. India eventually got independence within the orbit of this Act. When Britain granted independence to India in 1947, it was the first time in history that a colonial power willingly granted independence to a colony. India kept the 1935 Act as its constitutional framework for three years after independence and Pakistan kept is as its constitution for nine years. Indian Summers began the second series with the statement: ’1935, as tensions rise across the Indian Subcontinent Britain plans a new deal’. This is nonsense. The plan had already been enacted as an Act of Parliament and tensions had subsided. It is also ridiculous that the series portrayed the 1935 Act as an entrenchment of British rule whereas it constituted a sizeable transfer of power to the Indians. It is also ridiculous that Mr Whelan is shown suggesting that India should become a dominion like Australia and Canada when that had already been agreed by the British six years earlier and, indeed, was the point of the 1935 Act. It is apparent that makers of this series are wholly unaware of Britain’s achievements in India. This is demonstrated in Mr Rutnam’s interview in the series website when he asks ‘What did we think we were doing there?’. Before the arrival of the British, the Moghul empire was on the verge of collapse and India consisted of hundreds of princely states. It was the British who united the country. Concepts of parliamentary democracy, rule of law, independent judiciary and a free press were all introduced by the British. Tens of thousands of miles of railways and modern roads were constructed. The founding of thousands of hospitals, dispensaries and schools and hundreds of universities and colleges greatly improved health and educational services. The British irrigated millions of acres of land and the introduction of new crops such as tea continues to be an asset to India. The provision of postal and telegraphic services, modern banking, a tourist industry and detailed maps should be noted. The cities of Calcutta, Madras and Bombay were established. The first systematic study of Eastern cultures was initiated by the British following the founding of the Royal Asiatic Society. The contribution the Archaeological Survey of India made to further the understanding of Indian history was immense. No one voted, posted a letter, wrote a cheque, read a newspaper, went on a train or entered a museum before the arrival of the British. To answer Mr Rutnam’s question, the British transformed the governance, infrastructure and public services in India. The 361 universities, 13,056 secondary schools, 6000 hospitals and dispensaries, 42,000 miles of railways and 283,313 miles of paved roles which India had at independence did not simply happen. British civil servants identified needs and implemented the policies that made it possible. Yet in Indian Summers the viewer did not once see British officials discussing schools, hospitals, roads and railways. Instead, they were shown indulging in frivolity, uttering racist comments or repressing the Indians. This is grossly unfair. Not only in India but throughout the Empire, British officials, though sometimes having patronising views, were on the whole men of utmost integrity and genuinely cared about the local population. In Ceylon in 1931, when the first fully democratic elections took place, in one rural constituency, the local villagers voted for their retired British Government Agent, H R Freeman, rather than any of the local politicians. Indeed, he was so beloved of the people, that in the 1936 election, no one stood against him. In many colonies, after independence, British officials were asked to remain. In India, in addition to ordinary civil servants, Nehru asked two British governors to remain. Jinnah asked all his British governors to remain. One of Mountbatten’s private secretaries, John Christie was asked to remain. This would not have happened if the Indians were all contemptuous of British officials. After the internal governance of India was transferred to the Indians in 1935, British civil servants served their Indian ministers with great integrity. I am attaching extracts, vide infra, from ‘Congress in Office’ by N S Venguswamy. Please note this was written in 1940. The author was a staunch Congress ally and the main thrust of the book was how well Congress was governing despite British misgivings. Please also note how highly he speaks of British Governors and Civil Servants. In Indian Summers some British officials showed great kindness to Indians they knew personally but were generally contemptuous of the population as a whole. This was grossly unfair. There is much to commend about this series. Even though it is a drama, many viewers would assume it has been properly researched. It is clear that great deal of care has been taken with the authenticity of the sets, artefacts, costumes and settings. It is disappointing that such a cavalier attitude has been taken with the historical context. If anyone is interested in a balanced account of the period, please read V P Menon’s two publications – Transfer of Power and Integration of Indian States.